The classic television sitcom, ‘A Different World’ left a lasting impression on many for it’s rich diversity and representation of HBCU’s across the U.S. But what made the multicultural Hillman College campus stand out the most was it’s revolutionary style that the main cast embodied so well. 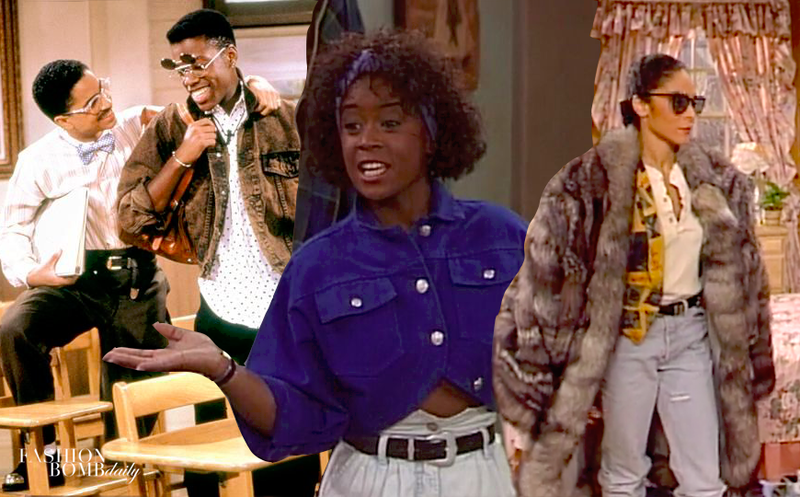 The show’s costumes fully embraced the ’80s and ’90s fashion era through each characters persona and own individual style. To this day, we’re still in love with some of these fashion trends: from mom jeans and crop tops to embellished jean jackets and high-neck tops, we’re obsessing over every bit of it. Take a look back at these stylish looks from the main cast! This spin off from “The Cosby Show,” Denise Huxtable’s character was the highlight of the show for at least a year. She was distracted from her studies and payed more attention to the fun side of college life. She embodied the ’80s style with layers, oversized sweatshirts, jumpsuits, mom jeans and wore earth toned hues to describe her down-to-earth characteristics. Whitley Gilbert was a sassy queen with bourgeoisie written all over her. She was not into gaining education so much either, but eventually fell into majoring in the Arts and French. Ceci felt she was easy to style because she was into name brands, so she put her in tailored business suits, fur coats, pearl accessories and so forth, and shopped mainly at Neiman Marcus. Dwayne was a mathematics major and was madly in love with Whitley. He delivered the ’80s connoisseur swag, especially with his selection of vibrant printed Cosby sweaters and patchwork bomber jackets. And let’s not forget his classic steampunk shades that are still trending to this day with celebs like Dwayne Wade and Rihanna rocking them! Ron was bestie’s with Dwayne and was the typical class clown of Hillman college. He saw himself as a ladies man since that’s what was typically running through his mind. His style was a mix between dapper and urban wear. Similar to Dwayne’s, but more of a relaxed fit. Freddie was one of the witty students out of the bunch. Her style was very spiritual, funky and eclectic. She wore lots of patterns and hippie dippie silhouettes, and wasn’t afraid to let her natural hair free. Lena’s character was seen as tough, blunt, yet was a definite catch to the fellas on Hillman campus. Even her ex Tupac could barely call it quits. Her style was androgynous, yet adorable at times. She wore petite crop tops, distressed denim, oversized jackets with embroidery, embellished earrings, and it wouldn’t be lena without a sporty cap to match! Jaleesa was all about business, but wanted a complete turn around, so she left her busy lifestyle to focus on school after she settled a divorce in her mid ’20s. She was savvy, charming, and powerful and it showed through her wardrobe. Ceci paired her flattering looks with pops of color added in the mix. High waisted slacks and mom jeans was her thing. And to match, she usually wore an afro-centric graphic tee which suited her well with her short cut. Kimberly was a perfect example of the girl next door at Hillman College–A straight-A student with goals that encompassed Black girl magic. Her style was simple, yet fun and flirty. Her looks weren’t too much or too little.